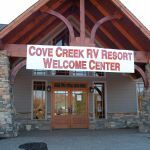 Ask fellow campers about "Cove Creek RV Resort" and nearby attractions. Good clean park. Exterior spots have more room. Clean bathrooms. Good views convenient to edge of Great Smokey Mountain park. Only downside is you must access from Pigeon Forge side which means slogging through the traffic. Price is comparable to rest of area. Ping pong table air hockey and common room TV and library were nice touch. All needs some light maintenance though. Good wifi. Cable signal weak and a little fuzzy. We camped at Cove Creek RV Resort in a Travel Trailer. Good views of Great Smokey Mountains. Friendly staff and fellow campers in a nice campground. Some pull/thrus, mostly back-ins, all gravel and level. We staid in one of the slots near the entrance and they were extremely roomy. Utilities good, including WiFi, cable and cell service. Small camp store onsite, and a pool and game room w/TV. Situated nicely between Pigeon Forge and Smoky Mountain NP. We camped at Cove Creek RV Resort in a Fifth Wheel. Love this immaculate, quiet, and very reasonably priced park located in the heart of Wears Valley. Nightly rate is based on a month stay and compared to area parks it can't be beat. The people that work in the office are terrific. The park is 8 miles from the hustle and bustle of Pigeon Forge but there are great places to eat within walking distance of the park. We had a premium concrete pull thru with lovely green grass and tidy shrubs. These sites come with a picnic table, concrete patio and fire pit. The pool is salt water and very nice sized. Clean laundry and game room with ping pong and a few treadmills. The only thing lacking is a fenced dog run - but there are plenty of places to walk dogs. Mentioned in an older review but worth mentioning again: if you have a big rig, come in from Pigeon Forge not Townsend. The road from Townsend is VERY curvy and while it can be done, is a big headache. We can't wait to come back again. We camped at Cove Creek RV Resort in a Fifth Wheel. Eat at Gepetto's Italian Restaurant across the street: excellent pizza and pasta and dessert. Also walk to Hillbilly's Restaurant just next door for pancakes in the morning! The park is very clean and well maintained. The location on Wears Valley Road in the mountains in beautiful. It is a bit of a drive into town every day down the mountain. We did pay more here than we usually do at other rv parks but, it was peak leaf season. Check in was friendly and efficient. Services all worked well. Bathrooms were immaculate. I would recommend this resort. We camped at Cove Creek RV Resort in a Travel Trailer. This park was amazing at taking us on short notice during the busy October season. Staff was very friendly. We had creekside gravel back in site. Site was plenty large enough for 41ft motorhome and space left to park tow car. Great laundry facilities. There are permanent residents here, everyone we met was friendly and site were kept up well. The pool and game room looked nice. Nice views of mountains and nice location away from busy tourist areas. Very close to an entrance of National park. Would stay here again. Camped in motorhome with toad. 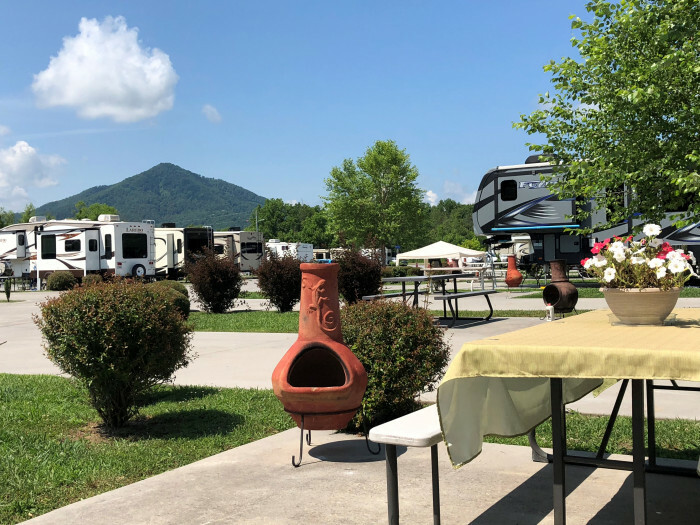 We camped at Cove Creek RV Resort in a Motorhome. We stayed 3 months while working for Dollywood. A little pricey but the view and peace is worth it. 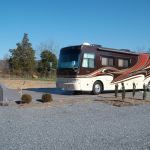 We camped at Cove Creek RV Resort in a Fifth Wheel. Stayed here for six nights while vacationing in the Great Smoky Mountain national park. The views from the RV park are wonderful. Wears Valley is just enough off the main parkway to still have the "campsite" feel. The main office is in a beautiful building and the staff is ready and waiting to help any way they can. The bathhouse and laundry were impeccably clean. The pool area was smaller than anticipated, five feet at the deepest end, but that didn't bother us much since the entrance to the park was only 12 miles away. The kids still enjoyed it. We did most of our swimming there. The rec room had air hockey and foosball that occupied the kids. The site we were on was a creek side gravel site. It was roomy enough for our 35 foot trailer and our Chevrolet 3500 truck. Ample grassy area for the kids to play behind the camper. The creek is very small, don't expect a big rocky creek bed, it's probably 3 feet wide at the widest point. The "fishing pond" was more like an old cattle pond and there was quite a bit of litter along the banks on the water. The premium and paved sites are nice and level, however if you spend a good amount of time outside your rig you may want to get the gravel sites. They are cheaper but a little nicer and more roomy in my opinion. Cable hookup wasn't the best in the world, a bit fuzzy on most stations. The WiFi was above average for parks that size. Not strong enough to stream movies but adequate to check emails etc. Overall we had a wonderful stay and we will definitely consider staying here if we ever make it back up that way. We camped at Cove Creek RV Resort in a Travel Trailer. Great place for close park access, quiet, beautiful, clean, wonderful staff. We camped at Cove Creek RV Resort in a Fifth Wheel. Pop for the creekside, so worth it. Forest access one mile. Close to everything fun. Traffic is terrible during leaf season, but not better at any other park. This is a very nice campground in a picturesque valley about 10 miles from the crowds of Pigeon Forge. Clubhouse-style bathhouse is spotless and modern. Very good laundry facilities, exercise equipment and an apparently nice pool which was closed for the season. Roadways are wide, some are paved and some are smooth gravel--same for the sites, which are wide and long. There are a variety of prices because of the variety of sites. One BIG WARNING, which has been mentioned in other reviews (which we ignored). Do not bring a big rig to this park from the Townsend side. The road is very narrow with very steep and sharp switchbacks. In fact, on our way in we saw police assisting a fifth-wheeler who had slipped off the pavement on the way out. No injuries and I didn't see much damage, but a tow truck was needed to get the trailer back on the road. No problem coming in from the Pigeon Forge side. Also, I'd suggest reserving by phone rather than their online res service. We booked on line for a mountain view gravel site and on arrival the system had put us in the group camp kitchen. The friendly manager switched us to site 35, and when we got there found it occupied. He then told us to go to site 31, which was fine. We camped at Cove Creek RV Resort in a Fifth Wheel. There's a decent restaurant next door and a small grocery store nearby. The closest supermarket we found was in Pigeon Forge. Quiet, very conveniently located near Gatlinburg & Pigeon Forge. We've stayed at this campground during the fall for the last 4 years, and have gotten great service every time we've been here. The sites are nice size, and the campground is quiet and well maintained. The bathrooms are very clean and there is a game room/pool for the big and little kids! If you're staying in the area, this campground is definitely in a great location, and worth a try! We camped at Cove Creek RV Resort in a Travel Trailer. Close to Pigeon Forge & Gatlinburg. What a find! Close to Pigeon Forge & GSMNP but in Wears Valley where it is peaceful & quite. We were there during "Rod Run" weekend and still felt "away from it all". Big rig sites with plenty of room - we could have parked another vehicle or two on our site. Power was good, site was level, restroom & game room extremely clean and nice. Cable TV was not the great but had a clear open view for satellite. It was a joy to stay here and felt welcome by the staff. Not a lot of places to eat but a short drive back to everything. Would only come to the campground from the Sevierville side with a large rig, the road (Hwy. #321 Wears Valley Road) I would not consider big rig friendly from the Townsend side. A joy to have stayed here a week and will return. We camped at Cove Creek RV Resort in a Motorhome. We come here 2 times a year some times more, we are from columbus, ohio. We love it here been coming here for about the last 5 or more years, wouldn't stray any where else. Very clean, friendly, every thing is excelent. We camped at Cove Creek RV Resort in a Motorhome. Every thing is easy to get too. Shoping, eating, gas stations. Conveniently located in Wears Valley with easy access to the GSMNP and Cades Coves. Great views of the Smoky mountains from your front window. Beautiful Club House, Pool and immaculate Bath and Shower facilities with laundry and game room. Concrete Pads and combined concrete, asphalt, gravel roads. Some pads are gravel. Our motorhome is 42 feet long and we had space for rear or front parking. Campground managers, Fred and Sandy Cain, are extremely friendly and efficient. Rates are daily but monthly rates available. Stayed for one month and will return when visiting the GSM again. We camped at Cove Creek RV Resort in a Motorhome. PROS: off the main drag, quiet, extremely well maintained, clean, level sites (most gravel unless you pay premium for paved), very nice staff, beautiful mountain views. CONS: cable box (pain for us as our TV is connected from back, and mounted to wall), sewer pipes were tall--took some work to get them to drain well. OTHER: we decided to stay two more nights, and were told we had to change sites. We did so willingly, but nobody ever showed up for the site we vacated. Upon check out, we were told there was no other reservation--we had moved for no reason--and they don't promise specific sites for reservations. Bottom line is that there is inconsistency in staff. We would stay here again. We camped at Cove Creek RV Resort in a Motorhome. 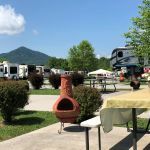 Are you affiliated with Cove Creek RV Resort ?